Our latest Blogger's Choice Bundle is the definition of colorful. Kelly of Stitchy Quilt Stuff and Andie of Andie Johnson Sews teamed up to put their love of rainbows into an adorable bundle. 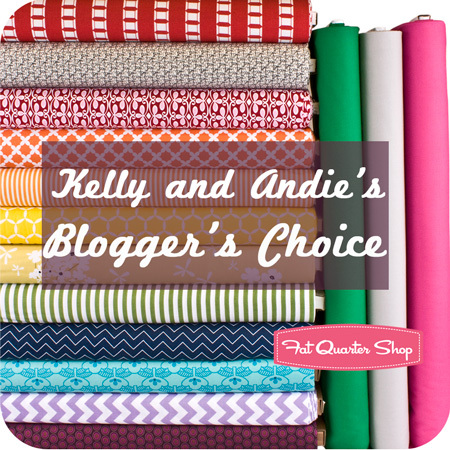 Their Blogger's Choice Fat Quarter Bundle features 12 ROYGBIV prints and three coordinating solids. Enjoy! A: Kelly and I are remaking some of the projects in our book Modern Designs For Classic Quilts. I'm going to be making the NY Beauty in our yummy rainbow mix and some scraps. The one from the book is done in black and white and is very structured, so I think it would be fun to make it again in juicy, fun colors and do it in way that isn't as formal. 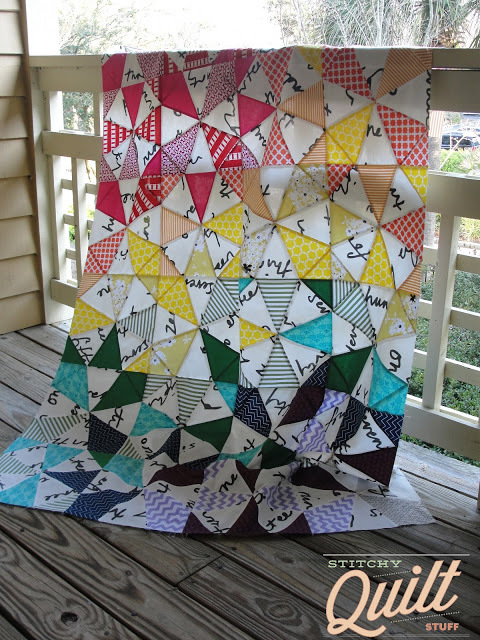 Kelly is remaking the Kaleidoscope Quilt with the bundle, putting a rainbow spin on it. It is very different from the two-color version in the book. The variety of colors gives you a lot of room for creativity! A: Andie has been doing some charity sewing lately - mostly quilts for Cincinnati Children's Hospital. Also, the Cincinnati Modern Quilt Guild is participating in a project for Craft Hope making bibs for orphans in China, so I'm finishing up sewing those. And I'm kind of obsessed with paper piecing these days, so I've been playing with ideas for patterns. Leave a comment on this post choosing one of each pair you think Andie and Kelly would have selected. Answer correctly and you will have a chance to win one of their Blogger’s Choice Fat Quarter Bundles. Contest closes Thursday 3/28. Good luck!